Wife. Mama. Wannabe crafter and professional procrastinator. Anyway, the lovely people at Tyndale have been gracious enough to not kick me out of their program, so I thought it was high time I hold up my end of the bargain! We absolutely LOVE this Bible! I could drone on for paragraph after paragraph about all of attributes, but let's just bullet point it for you, k? It uses actual Scripture. This is a big one for me! I don't mind story Bibles, but there is something about the actual Word of God -- it's powerful! And I want it in my children's lives from an early age. This Bible uses select verses from the NLT for each story. It's HANDS ON! I know, I know...Captain Obvious. But what makes it hands on is that they have written suggestions in the margins of every story for simple activities you can do to get your kids interacting with the story while you read it. For example, when you're reading Noah's Ark, they suggest having your kids, "Walk like an elephant, hop like a kangaroo, and run like a deer." I know some people are naturally just creative like that anyway, but I'm kind of the type of person that NEEDS TO HAVE IT SPELLED OUT FOR ME. So this is great! I would probably put this in my top two children's Bibles that I have seen and used. 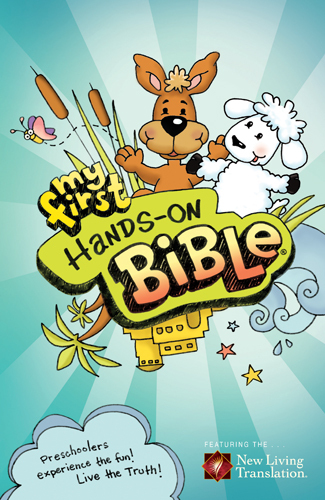 It's meant for children ages 3-6, but they also offer Hands On Bibles for the older kids as well. This Bible is available for purchase on the Tyndale website. This review copy was provided by Tyndale House Publishers. All opinions expressed are strictly my own.